Is it just me, or do George Clooney’s cheeks make him look a lot like Raggedy Andy? Next on the clock is the New Orleans Saints. How fast do you think they will get their pick up to the podium? Or how many phone calls are they going to receive for a trade offer? Tune in at 11am on ESPN to find out. For those of you who are interested the crib is a convertible “Infinity Crib” from Baby’s Dream Furniture, Inc. out of Buena Vista, Georgia. We bought it from Kids’ Stuff on North 27th Street. 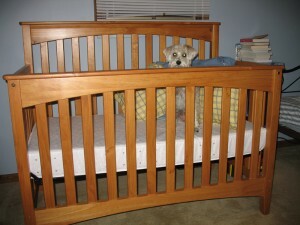 It is convertible, which means it converts from a crib, to a toddler bed, to a double bed. Assembly was a piece of cake: twenty bolts and I was done. I only found two small problems with the product: the top rail of the front frame is just a little loose (it just needs a touch of glue), and the instructions say in large letters “PHILLIPS HEAD SCREWDRIVER IS REQUIRED”, even though the only tools needed are the included allen wrench and hex wrench. Tiny complaints, both. I think we got a pretty decent crib for not much money. Now that I’m in a handy man mood I’m half tempted to install a couple ceiling fans we’ve had sitting around for a while. Too bad I don’t know anything about electrical wiring. Guess I’ll have to give my dad a call tomorrow and see if he wants to tackle that project with me. Let’s say, just for fun, that all of my games this weekend are cancelled. My lone high school soccer match tonight, my two high school soccer matches tomorrow, my two youth baseball games tomorrow night, and any Latino soccer games I may be assigned on Sunday. (Pst, Juan, where are my assignments?!) What the heck will I do with myself? The Missus plans to do homework for the Masters course she’s taking, so that rules out computer activities. Yard work is out due to the rain. I can’t paint because the room I want to paint happens to be the office, which is where The Missus will be camped out. I suppose I could clean. The Missus would like that. I could go buy a weed whacker. That’d be entertaining for about fifteen minutes. I could assemble the crib. That’ll seem a little strange since there’s nobody to sleep in it yet, but we may as well be prepared. I could organize the basement storage area. Ugh, that doesn’t sound fun at all, but it needs to be done. Anybody have any better ideas? A couple of the daily rags are reporting that assistant coach Scott Spinelli is leaving Nebraska to become an assistant at Wichita St. I wouldn’t be all upset about it but he’s been the one who’s brought in a lot of our “good” recruits. In reality, he was the only thing keeping Barry Collier here at Nebraska. Barry is gone after this year barring a miracle. Senate Republicans want to send you a check for $100 to spend on gas. I’m speechless. It’s like watching third-graders run government. Seriously, who could possibly think this is a good idea? Can anybody defend this idiocy? The Nebraska Baseball team has hit the midway point in the conference season and things are looking up.